There’s little doubt that when it comes to big data and the application of data science, the National Hockey League is quite a ways behind the other major North American professional sports leagues. But management teams, coaches and players are paying attention. In spots we’re even seeing evidence of data influencing decision making. One of those battlegrounds concerns the strategy of pulling goaltenders. Historically, coaching staffs have been extremely conservative. Down a goal, you would usually see the goalie pulled from the net with about 70 seconds remaining. 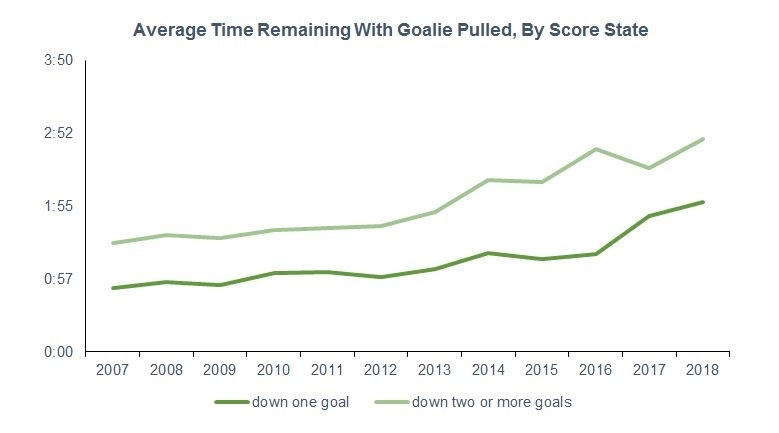 Down multiple goals, coaches would get a little bit more aggressive, pulling their goaltenders at around the 100-second mark. But that’s changed emphatically over the past few years. 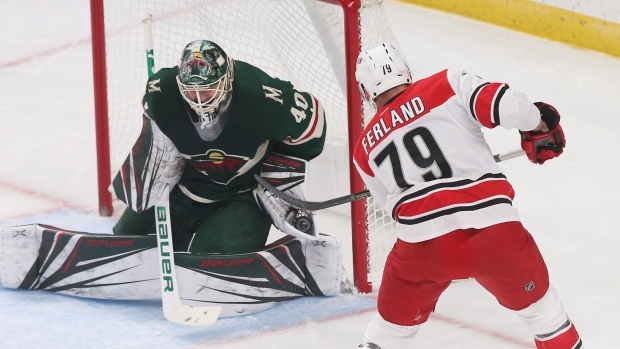 The first big change we observed was during the 2014-15 season, right around the time that a lot of research and material on goaltender pull strategy started appearing in public forums. Researchers have long argued that coaching staffs, generally speaking, were waiting far too long to get their goalies out of the crease. It’s a simple probability exercise – one that weighs the benefits of deploying an extra attacker versus the cost of either falling further behind or running out of time. I think it’s the running out of time aspect that was historically lost on most coaching staffs. The best way to think about it is by talking about the in-game probability of accumulating points. If you pull the goalie early and fail to score, you end the night with zero points in the standings. If you pull the goalie late and don’t score, you end the night with zero points in the standings. If you pull the goalie early or late and give up a goal, you still end up with zero points in the standings. More and more teams are recognizing that time is of the essence here. The 2018-19 regular season is already flush with examples of coaching staffs changing their behaviour. We had a pair of goalie pulls on Tuesday night that I would say deviate from historical norms. The Carolina Hurricanes, down one goal, pulled Petr Mrazek with about two-and-a-half minutes left on the clock. The Buffalo Sabres, down three goals, pulled Carter Hutton with just under five minutes to play. (The fact that the Sabres pulled Hutton at five minutes isn’t as interesting as the fact that the Sabres were unwilling to concede defeat at that point in the game; this has not always been the case.) The night before, Dallas pulled Ben Bishop with nearly eight minutes to go while down two goals! Despite in-year variances, the trend is obvious – behaviour started to change during the 2013-14 season, and really took off in future seasons. The last two years have seen a marked increase in aggressiveness, too. The 2018-19 season seems like another launch point, where teams are getting their goaltenders out at around two minutes (down one goal) and three minutes (down multiple goals). What’s fun is that you can drill back into games where teams did pull the goalie early and did realize a positive result. On Oct. 6, Vegas pulled the goalie with two minutes remaining down a goal and equalized through Max Pacioretty, then won the game in the shootout. On Oct. 13, Carolina pulled Curtis McElhinney with a couple of minutes left on the clock and down a goal. Not only did Justin Williams equalize at 18:51, but Carolina went on to win the game outright courtesy Sebastian Aho in overtime. In both games, ironically enough, Minnesota was on the losing end of these goaltender out scenarios. At any rate, it’s a very interesting trend for the league – and one that I think is going to catch on as more and more teams find success with it.